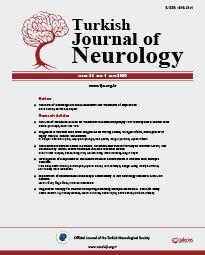 The Turkish Journal of Neurology is an independent, non-biased, periodical publication that adheres to the double-blind peer review process. The Publication Policy and Manuscript Writing Rules were prepared in accordance with the Recommendations for the Conduct, Reporting, Editing, and Publication of Scholarly Work in Medical Journals (ICMJE Recommendations) (2016, http://www.icmje.org). Submitted manuscripts are first evaluated for their scientific value by the editor. After initial evaluation, regarding to article’s topic one of the associate editors is assigned. Then, manuscripts are sent to at least two peer reviewers for evaluation. The Editorial Board may also send the manuscript to another reviewer if necessary. All reviewers are independent national and international experts in the field. After peer-review process, associate editor adds his/her own comments to the peer reviews and send them to the Editor-in-Chief. Editor-in-Chief considers peer-reviewers’ and associate editor’s comments and commits his/her final decision. The whole evaluation process is aimed to be finished within 3 months. Every submission is also evaluated by the statistics editor. Dates when the manuscript was received and accepted are stated in the issue the manuscript is published. The Editor-in-Chief and associate editors have the right to reject, return manuscripts for revision, or revise the format of manuscripts that do not comply with publication rules. For all complaints and appeals please contact Editorial Office. A complaint will be reviewed by Editor and the action will be taken. Whenever the investigation is completed and the decision will be made, the complainant will be notified upon the decision. Turkish Journal of Neurology must get informed about the manuscripts which requested to withdraw including the justifications. The decision is made in accordance with the editorial policies. For the experimental, clinical and drug human studies, approval by ethical committee and statement on the adherence of the study protocol to the international agreements (Helsinki Declaration revised 2013 (https://www.wma.net/policies-post/wma-declaration-of-helsinki-ethical-principles-for-medical-research-involving-human-subjects/) are required. In experimental animal studies, the authors should indicate that the procedures followed were in accordance with animal rights (Guide for the care and use of laboratory animals, www.nap.edu.catalog/5140.html) and they should obtain animal ethic committee approval. All collected data will not be shared with third-party person, organization or any other affiliation. Authors’ personal data (excluding corresponding author; it is stated in each article) is protected. Patients’ personal data will not be disclosured. The Ethic Committee approval document should be submitted to the Turkish Journal of Neurology together with the manuscript. The approval of the ethic committee, statement on the adherence to international guidelines mentioned above and that the patients` informed consent is obtained should be indicated in the `Material and Method` section and is required for case reports whenever used data/media could reveal identity of the patient. The declaration of the conflict of interest between authors, institutions, acknowledgement of any financial or material support, aid is mandatory for authors submitting manuscript and the statement should appear at the end of manuscript. Reviewers are required to report if any potential conflict of interest exists between reviewer and authors, institutions. All editors are experts in their own fields; therefore, all possilble conflicts of interest are prevented. In case of any, Editor-in-Chief will take the action according to COPE Guidelines. Plagiarism: To re-publish whole or in part the contents of another author's publication as one's own without providing a reference. Fabrication: To publish data and findings/results that do not exist. Duplication: Use of data from another publication, which includes re-publishing a manuscript in different languages without citing. Salamisation: To create more than one publication by dividing the results of a study preternaturally. We use Crossref Similarity Check powered by "iThenticate" to screen all submissions for plagiarism before publication. We disapproval upon such unethical practices as plagiarism, fabrication, duplication, and salamisation, as well as efforts to influence the review process with such practices as gifting authorship, inappropriate acknowledgements, and references. In case of suspicion, the authors will be asked for additional explanation. Further actions will be made according to COPE Flowcharts. Additionally, authors must respect participant right to privacy. On the other hand, short abstracts published in congress books that do not exceed 400 words and present data of preliminary research, and those that are presented in an electronic environment are not accepted pre-published work.